A pro-settler group is continuing with its efforts to spread illegal Jewish settlements in occupied East Jerusalem. Ateret Cohanim, reported Haaretz on Thursday, has obtained a court order to evict a Palestinian family from a building that the organisation now controls in Silwan, near to the Noble Sanctuary of Al-Aqsa. Several weeks ago, the organisation filed a request to evacuate other Palestinian families living in the area as it tries to seize more Palestinian homes. More recently, it applied for licences to build a three-story building in Silwan and widen the road leading to a Jewish settlement inside the neighbourhood, Haaretz explained. Ateret Cohanim has been active for years, making provision for Jewish settlers in Jerusalem and Silwan neighbourhood. Its activities revolve around taking control of the area of Batan Al-Hawa in Silwan, which it claims was home to Jews of Yemeni origin more than a hundred years ago. In this context the group seized the Beit Yonatan building, which was built without a licence and is now inhabited by 10 Jewish families. It has also placed another family of Jewish settlers in the Bait Hadvash building, according to Haaretz. "About two months ago," added the newspaper, "Ateret Cohanim took over half of the so-called Abu Nab building, named for the extended family that lived in it, and which once housed a synagogue for the Yemenite community." This settlement effort complements that of the Ir David Foundation (aka Elad), which focuses its activities in the so-called "City of David" near the walls of the Old City of Jerusalem. Critics have asked why the Israeli government and the Israeli-controlled Jerusalem Municipality say that it is illegal for Palestinians to live in "unlicensed" buildings but acceptable for Jews to be there. Israel is engaged in the Judaisation of Jerusalem. Evicting long-term Palestinian residents and revoking their residence permits is part of the ethnic cleansing process that has been ongoing since the state of Israel was created on Palestinian land in 1948. 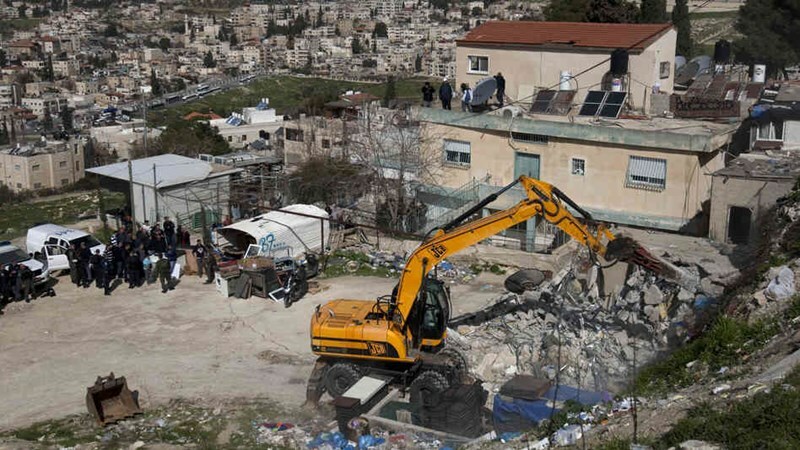 The Israeli civil administration on Thursday morning notified the demolition of 20 Palestinian homes in Abu Nawar residential complex, in East Jerusalem, under the pretext of unlicensed construction. 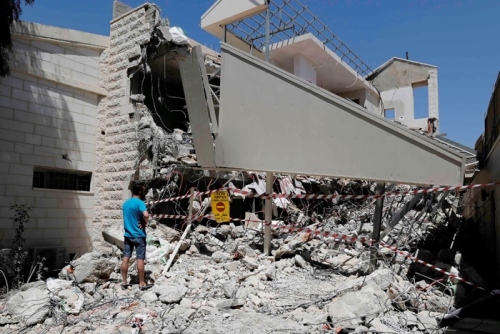 “We were shocked upon catching sight of the Israeli occupation authorities rolling into the area in the early morning hours and threatening to knock down the homes in three days,” spokesman for the Abu Nawar complex, Daoud Jahalin, told the Quds Press. He added that at least 150 Palestinian civilians have been taking shelter at the targeted homes, having no other places to resort to. The Abu Nawar residential complex, covering some 389 dunums, has been a home for 105 Palestinian families, setting up roots in the area since the early 1950's. Observers said the notifications make part of a larger Israeli policy of ethnic cleansing aimed at deporting the Abu Nawar Bedouins, who have been living on agriculture and nomadic herding of sheep, from their own and only homes. 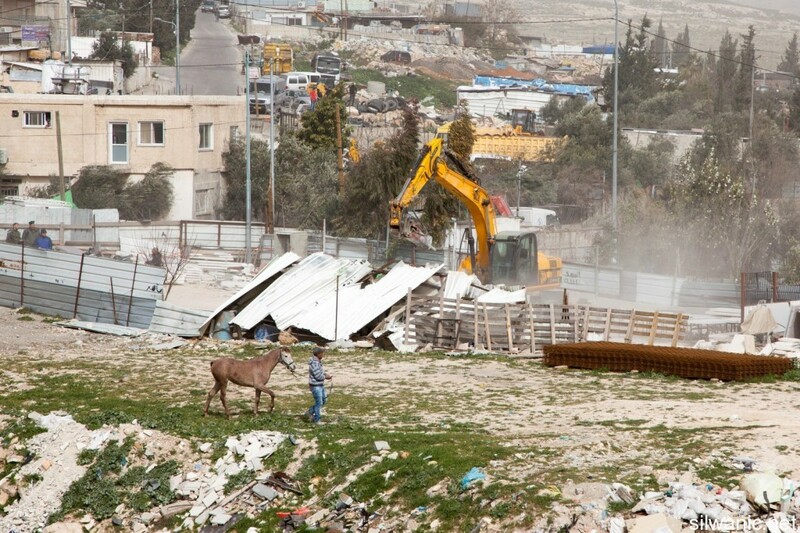 Israeli occupation forces on Thursday morning demolished a number of houses and other structures in the eastern outskirts of Bethlehem in the southern West Bank, local sources told Ma'an. The first demolition was in the village of Tuqu where Israeli troops escorted a demolition crew that tore down an incomplete house belonging to a man identified as Mousa Salim Hasan. Another demolition took place in the nearby village of Harmala, where a demolition crew protected by Israeli forces demolished an incomplete house belonging to Muhammad Majid Dabash, the mayor of the municipality Aiad Ali told Ma'an. 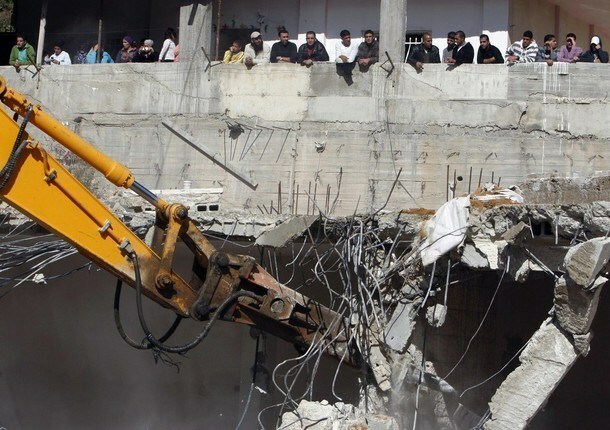 A third demolition targeted a house's exterior wall in the town of Zaatara. The Municipal Council of Zaatara wrote on its Facebook page that the wall belonged to Khalaf al-Himri. Israeli forces also confiscated a shipping container which the owner used for storage. The owner was told he would be asked to pay the costs of demolition. An Israeli army spokesperson did not immediately respond for comment. Since the beginning of 2015, Israeli forces have demolished 294 structures in the occupied Palestinian Territory, leaving 251 Palestinians displaced, according to the Israeli Committee Against House Demolitions. Israeli forces, on Tuesday morning, have demolished three residential structures near the Hamra military checkpoint, central Jordan Valley. Jericho governor Majd Al-Fityani said, according to the PNN, that soldiers tore down three homes, displacing three families who were living in them. Al-Fityani stated that these arbitrary acts were not the first of their kind. The governor warned that numerous Bedouin groupings are now threatened with eviction from their homes in the Jordan Valley region. Israeli soldiers demolish, on Tuesday morning and on Monday at night, a number of residential and agricultural structures, and barns, near the al-Hamra military roadblock, and in al-Jiftlik, Zbeidat, Froush Beit Dajan and Hamsa, in the West Banks’ Central Plains. Bsharat said this is the third time the soldiers demolish his residential structures since 1996, and that some were built before the 1967 six-day war, when Israel occupied the rest of Palestine. "My family will never give up; we will never surrender," he stated, "We will rebuild; this is our country, and here he will stay." Late on Monday at night, soldiers demolished several structures, used by street venders, near the al-Jalama Israeli military roadblock, north of the northern West Bank city of Jenin, as part of the Israeli plan to expand it. The soldiers also demolished a small restaurant belonging to resident Fayez Sha’ban, and a garage owned by Sadeq Abu Faraj, after illegally confiscating their properties. Soldiers also demolished several barns, and agricultural structures belonging to a number of residents in the Central Plains of the occupied West Bank. Member of the Executive Committee of the Palestine Liberation Organization (PLO), the head of the Jerusalem Department Ahmad Qurea', denounced the destruction of the Palestinian property, including the Tuesday morning demolition in Jerusalem, and said the latest violations "are part of Israel’s criminal polices that violate International Law, and all human rights treaties." Erekat added that Israel is openly challenging the International Community, by land theft, destruction of homes and property, and ethnic cleansing against the Palestinians, and is benefiting from the idleness of the world regarding its racist polices, especially its policies targeting the existence of the Palestinian in occupied Jerusalem. 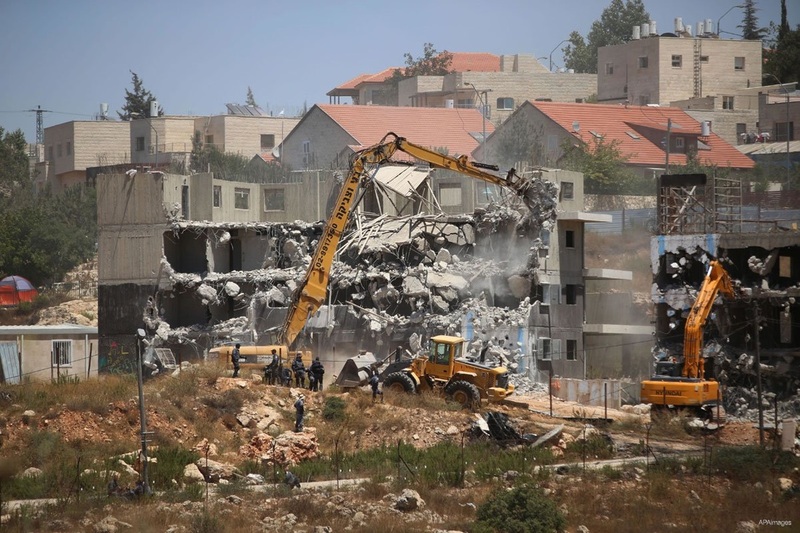 The Israeli army demolished, on Tuesday morning, a commercial building in the Industrial Zone, north of occupied East Jerusalem, after surrounding the entire area. Several Israeli vehicles, accompanied by army bulldozers, surrounded the area and declared it a closed military zone, before demolishing a building that belongs to resident Mazen Abu Diab, the Wadi Hilweh Information Center has reported. Part of his building was constructed in 1971, and he added 100 square meters to the building, two years ago. He added that he filed all needed papers to the Jerusalem City Council since he started modifying his structure, but instead of receiving a license, he was informed the City Council intends to demolish his structure, but never received a demolition order. The demolished building was a three-story building of 220 square meters, composed of four rooms, in addition to two meeting halls and their facilities. Abu Diab was conducting final preparations to prepare it for office use. The Israeli Occupation Forces (IOF) stormed overnight Palestinian lands near Jalama crossing, north of Jenin, and demolished commercial stores near the area. Local sources affirmed that the demolished facilities include a taxi office, a grocery store, and a small coffee shop that were notified with demolition two months ago. Israeli sources claimed that the demolished facilities constituted a security threat to the crossing that links between Jenin and the 1948 occupied territories. The demolished facilities provide urgent services to thousands of Palestinian workers, who are daily obliged to pass through Jalama crossing to reach their workplaces. The Israeli Occupation Forces (IOF) stormed Monday morning al-Dahriya town in al-Khalil accompanied with military bulldozers and started demolishing Palestinian-owned facilities. 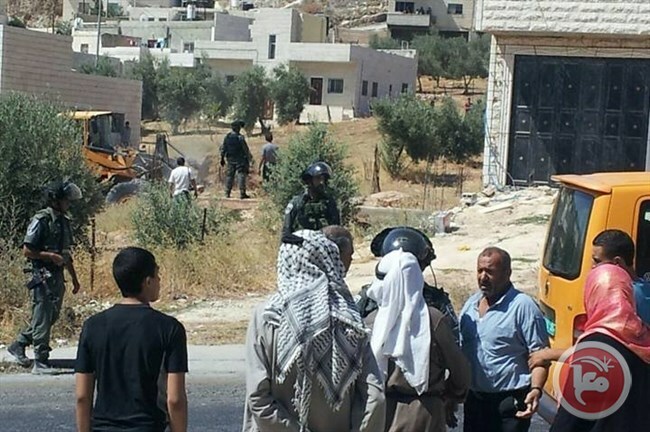 Locals affirmed that a large number of Israeli forces broke into the area since the early morning hours and demolished agricultural facilities belonging to Sharkh family under the pretext of being built without permit. Local residents, who tried to prevent the demolition process, were violently prevented from approaching the area. 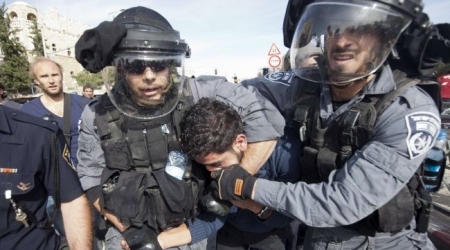 Israeli forces, early Monday, abducted six Palestinians and summoned another from West Bank districts, said security sources. 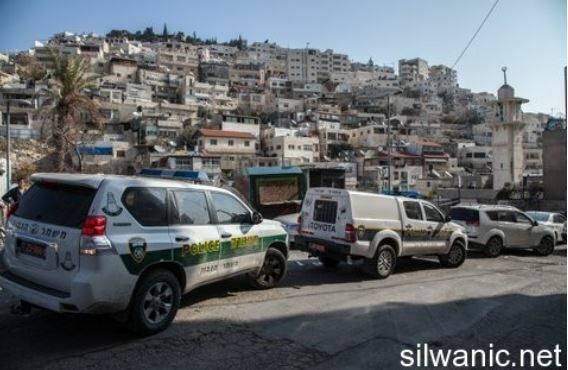 According to WAFA correspondence, Israeli forces raided the Jenin city neighborhoods of Jabal Abu Dhuheir and al-Marah, where they proceeded to break into several homes and interrogate their homeowners. Two of the homeowners were identified as Muhammad An-Nasra and his son, Hani. During the pre-dawn raid, forces kidnapped four Palestinians identified as Jehad ‘Arqawi, 26, Ahmad Khalaf, 25, Yahya Najm, 19, and ‘Awad al-Jamal, 24. Meanwhile, in occupied East Jerusalem, police detained a Palestinian after breaking into and ransacking his house in Beit Hanina town. The detainee was identified as Wisam Kastiro. In the meantime in Hebron district, forces took another Palestiian into their custody after breaking into and ransacking his house in Bani Na‘im town, to the east of the city. 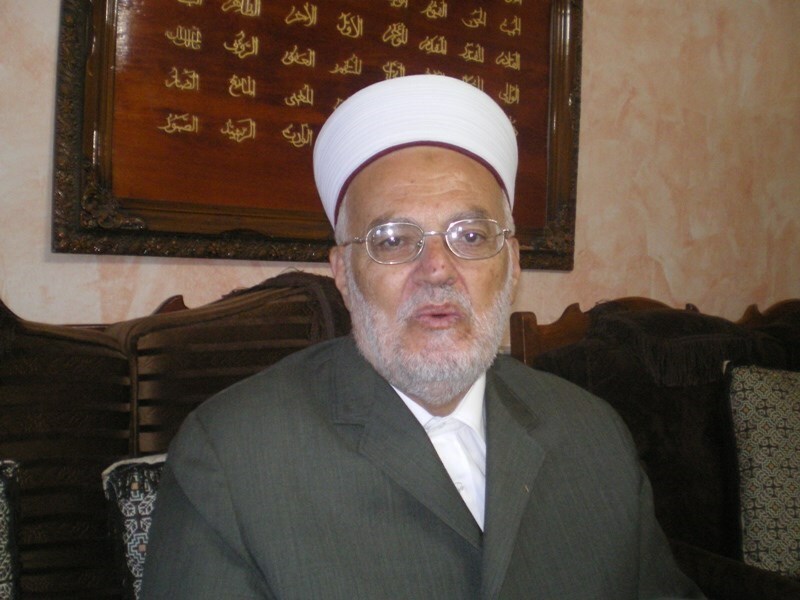 The detainee was identified as Walid Ziadat. Israeli forces also raided several Hebron neighborhoods and set up roadblocks at the entrances of Sa‘ir and Halhul to the north of the city, where they stopped and examined Palestinian registered vehicles travelling along the way, interrogated passengers and inspected their ID cards. In the meantime, in the Bethlehem district, forces summoned a Palestinian from Ad-Duheisha refugee camp, south of the city. Karam ‘Abed-Rabbu was served with a notice summoning him to appear before Israeli intelligence in the Gush Etzion interrogation and detention center. The raid sparked clashes with local Palestinian youth. Armed Israeli settlers fired tear gas canisters and stun grenades at youth armed with stones and empty glass bottles, causing several to suffocate. Israeli forces, early Monday, demolished a Palestinian house in Deir Ballut town, to the west of Salfit, as well as two residential structures and a livestock barn in Adh-Dhahiriya town, to the south of Hebron. Israeli forces, escorting two bulldozers, raided the town, where they demolished a Palestinian house under construction, and belonging to ‘Adnan ‘Abdullah in the Khallet Qasul locality, to the south of Deir Ballut. This was the second time that ‘Abduallah’s house has been demolished. It was demolished about a year and a half ago in the same spot, in Khallet Qasul, a locality in Area C which contains over 60 Palestinian houses and is considered one of the areas which regularly receives stop-construction and demolition notices. Local media reported on ‘Abdullah as saying that, although he submitted proper building permits, he was served a notice two months ago to demolish his house, prompting him to leave no stone unturned in order to halt the implementation of this notice, but to no avail. Furthermore, Israeli forces demolished two residential structures and a livestock barn in Adh-Dhahiriya village of Ar-Rahwa. Israeli soldiers again escorted a bulldozer, raiding the village, where they proceeded to demolish two residential structures and a livestock barn belonging to Farhan As-Samamra, displacing 24 people. Meanwhile, forces served demolition notices for several Palestinian houses near al-Hamra permanent military checkpoint, on Road 57, which is controlled by Israeli authorities. All Palestinians whose houses are located to the north of the checkpoint were handed notices, giving them only 10 days to evict their homes as a prelude to demolition. Israeli Occupation Forces (IOF) Monday overnight continued a wide campaign of kidnapping youths and children, in addition to handing out demolition orders. 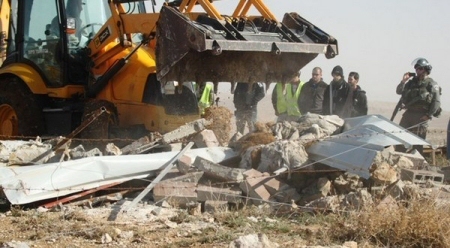 PNN reoporter said that IOF have demolished a facility used for sheep in Thahriyya village that belongs to a citizen, and handed a citizen a demolition threat to the well he owns in Yatta. IOF then moved to kidnap a number of youths from the Hebron district, including towns of Halhul, Bani-Nu’aim and Si’ir. Among the arrested were three children from Si’ir village, aged 14. The three were taken to the Ofer military court after they received notices to go to the Israeli intelligence on Sunday. 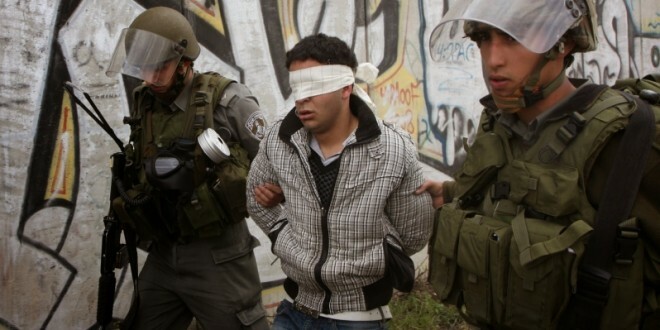 IOF did not give any reasons for the kidnap, and the number of detainees is still unidentified. Israeli Occupation Forces (IOF) on Sunday blocked water tanks from reaching Bedouin families in Wadi al-Maleh in the northern Jordan Valley in absolute disregard to the severe hot weather. Local sources revealed that the IOF soldiers stopped Palestinians’ tractors towing water tanks, blocked their traffic, and prohibited them to access the area. The sources pointed out that the IOF deliberately pressures Bedouins in the region with the aim of forcing them to leave their homes in Wadi al-Maleh. The Israeli forces prevent Bedouins from using water springs in the area and consider water transfer via tanks an offense for which drivers get penalized by confiscation and fines. 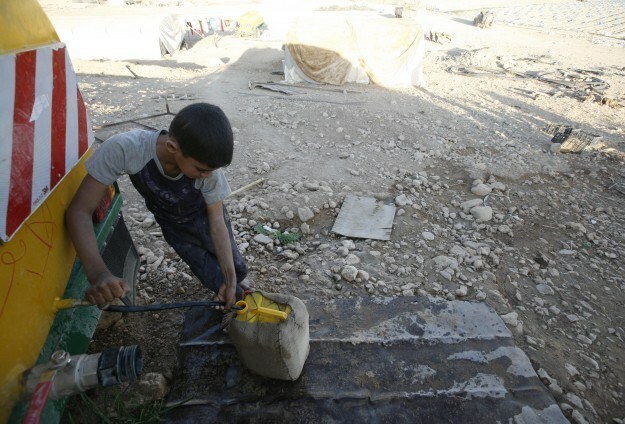 Besides, the confiscated water tanks are usually transferred to Israeli military camps. Jewish settlers burned hundreds of dunums of pastoral lands in different locations to the south of Nablus city on Sunday evening. 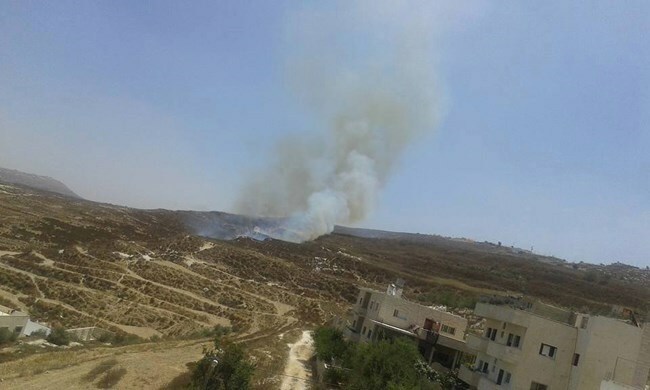 The activist Zakariya al-Siddeh told the PIC reporter that settlers of Arosah settlement set fire to 15 dunums of pastoral lands in a district to the east of Borin town. Palestinians along with civil defense vehicles hastened to extinguish the fire but settlers hindered the process leading to the spread of fire to the adjacent areas. Eyewitnesses revealed that the fire spread very quickly and caught hundreds of dunums in the two nearby towns called Iraq Borin and Enabous. 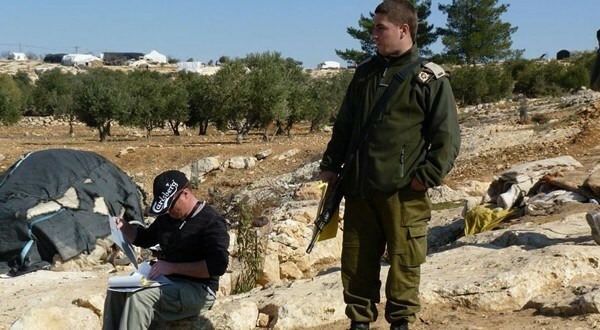 Groups of settlers were deployed over mountains’ tops under protection of Israeli forces and tried to prevent civil defense cars from reaching fire locations. Meanwhile, clashes erupted between Palestinian citizens and Israeli soldiers who protected settlers and fired rubber bullets and tear gas at the civilians. A number of youths suffered suffocation and received treatment in the field.